We are instrumental in offering our clients with highly functional PV Array Junction Box. This PV Array Junction Box that we offer is fabricated with the use of latest technology and is suitable for different Solar Power applications. Our PV Array Junction Box is properly tested by the experts under strict industry norms to guarantee flawless functioning and durability. 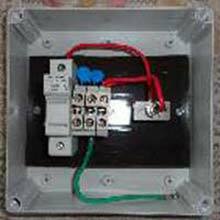 We offer our PV Array Junction Box at reasonable prices. We are offering pv array junction boxes pv array junction boxes for surge arrest & protection for solar power application 600 to 1000 volt dc housed with spd's / mov , diodes, heat sink, fuses in a poly carbonate box.